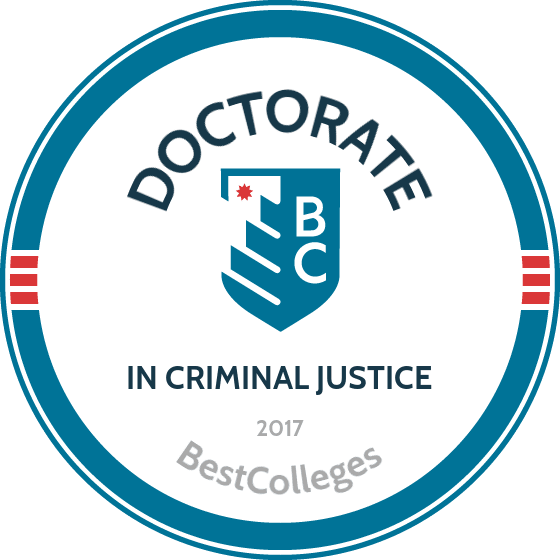 WHAT ARE THE BEST ONLINE DOCTORATE IN CRIMINAL JUSTICE PROGRAMS? What Else Can I Expect From an Online Doctorate in Criminal Justice Program? Earning a doctorate in criminal justice online helps working professionals gain the knowledge to direct research initiatives within the field or gain employment in the highest levels of judicial decision-making, either as a research director or criminal justice administrator. As a specialist in criminal justice, you will have the knowledge to guide judicial bodies and enforcement organizations in the coordination and design of systems to improve police-community relationships, facilitate benefits for criminal justice personnel, and conduct training for new and seasoned professionals. The skills gained in an online doctorate in criminal justice program are valuable for the enforcement of legal standards at all levels of the judicial system. According to the BLS, a postsecondary instructor in criminal justice earns a median annual salary of $65,690 as of 2017, and job opportunities are projected to grow by 13% over the next seven years. An online doctorate in criminal justice program is designed for students who have already earned a master's or bachelor's in criminal justice studies or a related field. Most candidates for a criminal justice doctoral program have about four years of previous education and/or work experience in the field, along with extensive exposure to research protocols and standards in criminal database organization. However, exceptions can be made on a case-by-case basis for those whose educational and professional backgrounds are not directly in criminal justice. There is no such thing as one “right” program for all individuals. Depending on what law enforcement area you already have a background in and what specializations you want to pursue a career in, the best criminal justice doctoral programs will reflect your specific interests. Most colleges and universities are equipped to answer questions you may have about leveraging your experience to pursue a doctoral program, so talk to your department head or ranking officer. CAN I WORK WHILE I COMPLETE MY ONLINE DOCTORATE IN CRIMINAL JUSTICE? Doctoral programs in criminal justice are usually tailored to fit the needs of mid-career officers or enforcement professionals who are seeking to broaden their knowledge base and training. In fact, the community of peers that online learning fosters allows for a high degree of collaborative learning. All of this can typically be achieved while still continuing to work while in school. The advantages of earning a doctorate in criminal justice online include self-direction and a flexible schedule. By remaining flexible in terms of access to courses and pace of study, an online program allows you to find a balance between current professional or family obligations and your academic life. An interdisciplinary online program, the Ph.D. in Criminal Justice at NSU prepares students for opportunities in areas such as academia, research, and management. The 60-credit doctorate in criminal justice online program is comprised of core courses, specialty tracks, and a dissertation. Graduates master the examination and analysis of crime data, becoming instrumental in the development of solutions to crime and challenges in the justice system. Coursework in the online doctorate in criminal justice program includes the study of criminal law, statistics, research methods, data analysis, and a dissertation. Concentrations are offered in organizational leadership, behavioral sciences, and juvenile justice. A full-time student who takes three classes a semester may complete the program in three years. Admission requirements for the online doctorate in criminal justice include a master’s degree in criminal justice with a minimum 3.0 GPA; a minimum GRE score of 300 is required. Criminal justice professionals at the mid- to senior levels can advance their skills and enhance their career trajectory with Cal U’s 42-credit Doctor of Criminal Justice. The online doctorate in criminal justice is designed for top professionals in agencies such as police departments, correctional facilities, and legal aid offices and courts. Coursework includes the study of 21st century police management, applied criminal justice research methods, criminal justice training, leading criminal justice agencies, and civil liability. A comprehensive examination is required before students move on to doctoral candidacy and the development of a capstone and professional research portfolio. The program is unique among criminal justice doctoral programs because it is the first one in the nation to be regionally recognized. It is also one of the criminal justice doctoral programs that can be complete in two years with part-time study. Admission requirements include a master’s degree in criminal justice, criminology, or relevant discipline such as law, with a minimum 3.5 GPA. An online doctorate of criminal justice is intended for experienced law enforcement professionals who have already obtained a master's in criminal justice or law, and generally involves a high degree of specialization. Students can expect to be self-directed in their research and experience a hands-on curriculum. Some Ph.D. programs may have more of a focus in research areas, while others may have more of a focus in law enforcement practices and procedures. To get a general idea of what courses an online doctorate in criminal justice could feature, consult the list below. Philosophy of Law, Justice, and Social Control: This course includes a comprehensive overview of the structure of the criminal justice system. Current needs and the projected evolution of those needs are assessed in terms of the different roles within the judicial system. Panel discussions and written critiques are prepare students for academic research positions. Race and Ethnicity in Crime and Criminal Justice: Issues of race and ethnicity are examined in the context of modern law enforcement, including an examination of bias and structural problems. Typical areas of focus include racism in policing, law enforcement disparities, and the role of community engagement and policy reform as preventative measures to curb incarceration. This course is conducted to prepare justice professionals to conduct necessary training initiatives. Qualitative Research Methods: This course involves an in-depth analysis of methods for organizing research initiatives within the criminal justice system. Students work in focus groups, case studies, and ethnographic analysis. All areas of advanced law enforcement can benefit from this systematic approach to information architecture. HOW LONG DOES IT TAKE TO GET AN ONLINE DOCTORATE IN CRIMINAL JUSTICE? A Ph.D. program is typically the most time-intensive academic track in any field, and the length of time that it takes to complete will vary depending on the amount of professional experience an applicant has, the level of specialization of the online criminal justice doctoral degree programs being pursued, and the type of degree an applicant is entering the doctoral program with. In addition, the pace at which a student progresses along their degree path may vary according to whether they are full- or part-time students. Criminal justice Ph.D. degrees take less time than most other doctoral programs, with full-time students completing all requirements within two to four years on average. Some online doctoral programs also require applicants to enter the program together as a group in order to properly facilitate online discussions, testing, and forum usage. In general, a criminal justice Ph.D. requires that students complete between 50-80 credits of coursework, with additional dissertation requirements. Accreditation is important in order to maintain a high standard of education, as accreditation indicates that a school has met a minimum set of standards. Both regional and national accreditation is given after a thorough examination of the school by a third-party organization. National accreditation is a separate but necessary requirement of any college attended with received federal grants or aid. There is no specific accreditation required in addition to regional or national accreditation regarding the best online doctoral program in criminal justice, but some programs work directly with law enforcement agencies and may offer exclusive research opportunities. Criminal justice programs have no official accreditation bodies, but some organizations, such as the ACJS (Academy of Criminal Justice Sciences) exist to distinguish especially excellent programs. The Department of Education is a federal agency established in 1979 to regulate policies concerning all schools and colleges within the United States, as well as to coordinate federal assistance for education, gather data about schools, and enforce federal laws regarding education. It works to promote the success of education within the United States and has no direct hand in the accreditation process itself. The CHEA and similar bodies work to maintain educational standards and keep universities competitive with colleges and schools within the U.S. Interested applicants may look for one of the seven organizations that make up the Council of Regional Accrediting Commissions. A list of universities with accreditation is available directly from the U.S. Department of Education. Georgetown University's Center on Education and the Workforce (CEW) has found in a recent report that criminal justice professionals with a graduate degree, such as one obtained through a Ph.D. in criminal justice online program, faced a 3.2% unemployment rate. By comparison, the unemployment rate for professionals with a bachelor's degree and some professional experience is recorded as 4.1%, and 7.6% for recent graduates without experience. In addition to natural variation between workplaces, the level of professional experience of a graduate or Ph.D.-holder will impact the annual earnings of a position within the criminal justice field. The following table features data from the Bureau of Labor Statistics regarding the states with the highest-paying salaries for the positions of adjudicator and hearing officer. The career paths that online criminal justice doctoral programs prepare graduates for include the highest levels of criminal justice administration, as well as academic research and instruction. Detail-oriented individuals might find satisfaction in a research position at a school or as a professor of criminal justice theory and practice. More generalist-oriented individuals might find themselves gravitating towards an administrative position within a corrections facility. Whatever your inclination, a doctorate ensures the highest level of expertise and preparation. A criminal psychologist studies the emotional, social, and cognitive pressures that drive individuals to commit illegal activity. By interpreting information, conducting interviews, and evaluating responses, criminal psychologists strive to understand how criminal intent originates and develops. A judge or hearing officer studies law and criminal case precedents to administer legal cases and facilitate the legal process in and out of courtrooms. They also are involved with resolving disputes in criminal cases, as well as negotiating differences of opinion between opposing parties. Postsecondary teachers in criminal justice instruct in wide variety of legal research areas and publish their findings to journals and other publications. Generally, doctoral graduates are experts in their particular specialization, and conduct their own research initiatives, often with the help of a student faculty. A probation officer or a correctional treatment specialist is involved with monitoring the work of probationary systems and directing the work of officers within that system. Through exercising preventative measures, probation specialists work to create new systems for the prevention of crime. Historians with a criminal justice specialization write and publish in both academic and non-academic contexts about criminology and judicial proceedings. They analyze research of other experts and interpret their findings in books and essays. Leading organizations in the field of criminal justice administration have developed ways to help emerging professionals and recent doctoral graduates gain access to networking opportunities, attend conferences, and obtain career services. These organizations, such as the RAND Corporation and the Academy of Criminal Justice Sciences, offer continued learning opportunities and training in the field of criminal justice policy and can be leveraged to forge key relationships with current policy leaders in law enforcement bodies. The NIJ is concerned with the development of technology for criminal justice organizations, such as law enforcement and corrections facilities. They also conduct social science research through grants, often in partnership with state and local governments. The NABCJ is a non-profit organization created to draw attention to legislation and policy that affects the African-American community. Its emphasis is on the court system and on crime prevention, as well as administrative reform. The ACJS is an organization created to distribute and foster scholastic endeavors in the criminal justice and criminology field. The organization works with governmental bodies to promote education, research, and policy analysis. Students should do research on FAFSA loans to understand funding opportunities like scholarships, grants, loans, and work-study. Many low-interest rate funds exist with banks and lending partners in education. Many schools also have degree programs that allow students to work for the school in exchange for their degree. Organizations such as the Association of Doctoral Programs in Criminology & Criminal Justice offer resources for funding online doctoral programs in criminal justice. Certain college programs are also eligible for tax breaks and some military organizations cover the cost of education in exchange for service.